You can’t miss the new Soho House Amsterdam. In the city centre, where the rings of canals are lined with slender Dutch gable houses, the sturdy, imposing 1930s Bungehuis dominates its prime corner plot on Spuistraat. This prominent landmark is one of the latest in a line of architectural finds the Soho House Group has commandeered for its network of private members clubs around the globe. Similar in size to the Istanbul and Berlin houses, the Amsterdam outpost follows the group’s tried-and-tested formula of a Cecconi’s restaurant and Cowshed spa (on the ground floor), guestrooms (79 spread over floors 1-3), a gym and screening room on the fourth floor with the club and House Kitchen on the fifth. It’s crowned by the signature rooftop pool and bar, albeit smaller than most. In this case, the rooftop wraps around the entire building, offering a 360-degree city panorama. It being the ‘dam, there is also parking for 75 bikes, plus a workshop for repairs. Granted ‘monumental’ (listed) status, the pale six-storey limestone and granite-clad Bungehuis is a blend of architectural styles – art deco, functionalist and Amsterdam School, with a hint of brutalism. Revolutionary at inception, it was the first building in the city to possess a completely concrete structure. 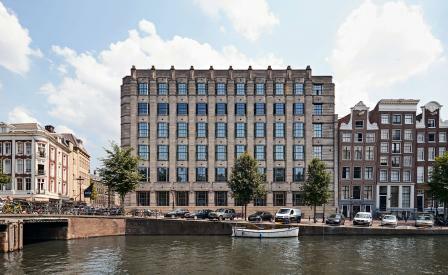 Originally the headquarters of a trading company, in recent decades it served as the humanities block for Amsterdam University until 2015 – which meant that heritage details were preserved. Large bronze-framed bay windows lend the façade its rigid geometry, while inside the glazed tilework of the ground floor lobby, lift lobbies and main stairway adds period character. An extraordinary series of stained glass windows lines the grand staircase, running the full height of the building. Their delicate art deco pattern is replicated in textiles, such as bed throws, for the new house. Above the ground floor level, the property is structured around an internal courtyard, so despite its imposing appearance from outside, the interior is composed of compact, moderately-scaled spaces that are flooded with natural light. In keeping with the House style, the interior design takes its cues from the host building, other key city landmarks and the local vernacular. The fifth floor club room features high-gloss black timber floors, a feature found in historic Dutch residential properties. Meanwhile, the bar front is lined in fabric applied with studs. ‘In Amsterdam rather than wallpaper or paint, they used fabric to warm a place up, so we applied it to the bar front,’ says Boronkay. Most impressive is the lighting. Floor and table lamps are all reconditioned antiques sourced predominantly in the Netherlands, while ceiling and wall lighting is bespoke, made by a local supplier.